Just when analysts and journalists were believing that interest in acquiring Internet advertising firm DoubleClick had perhaps dwindled, it’s Google that made the big play late this afternoon, beating Microsoft to the line in a deal Google says late this afternoon is worth $3.1 billion in cash. The deal comes as a boon to the equity investment firm which had purchased the once-colossus, later-troubled online ad broker for $1.1 billion two years ago. Microsoft was reportedly the first bidder, in a deal that analysts believed would only have been worth $2 billion – but just a few weeks ago, that seemed like a lot, perhaps even too much. But what appeared to be silence to some observers may have been Microsoft quietly upping its counter-offer, maybe more than once, in a round of serve-and-volley with Google that the latter has clearly won. In a very carefully worded comment late this afternoon, Google CEO Eric Schmidt said, “DoubleClick’s technology is widely adopted by leading advertisers, publishers and agencies, and the combination of the two companies will accelerate the adoption of Google’s innovative advances in display advertising.” Schmidt doesn’t exactly say Google will utilize DoubleClick’s platform; in fact, he points to his own company’s “innovative advances,” which could conceivably replace DoubleClick’s without too much disturbance of its customer base. 11:00 pm ET April 13, 2007 – This afternoon’s joint Google/DoubleClick briefing with analysts did not have the characteristic Google attitude. Many queries were posted, as it were, but few search results turned up. The reason, Google CEO Eric Schmidt, was made clear right away: Although today’s deal, consummated just hours earlier, was “something we’ve thought about for a very, very long time,” neither side had actually worked out the major details. So the degree of what isn’t known this evening is substantial – in fact, it’s perplexing, especially with regard to a $3.1 billion cash investment. The role current DoubleClick CEO David Rosenblatt will play, if any, in a company that’s already stacked to the rafters with executives, may yet be determined. Just how Google came up with the $3.1 billion bid is just as unknown, except for the fact that it has that much cash on hand. Executives on both sides refused to answer questions about how DoubleClick was evaluated, exhausting the usual side-step responses (“We typically don’t give guidance…”) until they started just winging it: Schmidt, at one point, perhaps in an effort to fill time in search of a more appropriate answer, explained the two companies happened to lease office space in the same New York building (the Caledonia on 17th Street and 10th Avenue), implying that since they were neighbors already, they concluded they may as well be family…and that was where the two companies saw the value. Another question: Has the deal been run by the Federal Trade Commission for guidance yet? Google vice president and general counsel David Drummond audibly stalled for time, uttering random phonemes before answering that this is the sort of thing merging companies generally do, so they indeed plan to do that. The merger process, we did learn, could consume most, if not all, of this year. As Drummond explained, “We expect the transaction to close sometime later in this year, subject to the regulatory requirements. Until that time, DoubleClick will operate as an independent company.” The question to which he was responding was, why will the process be completed late in the year; essentially, he confirmed the premise without repeating it. This was one of the more informative responses analysts heard all afternoon. Based on that, one could come to the conclusion that DoubleClick’s management team was what appealed most to Google’s. What happens to DoubleClick’s Performics 50 index? Let’s look at the background behind Eric Schmidt’s “most compelling argument:” DoubleClick basically established the Web advertising industry, long before Google entered the scene. It created the standard for click-through advertising, whose original metrics included cost per “impression” (CPM, a term borrowed from print advertising) and its interactive successor, cost-per-click (CPC). In recent years, DoubleClick actively explored methods to achieve more reliable metrics than CPC. In 2005, the company established a concept called the Performics 50 index – a kind of benchmark which companies could use to judge the standard rates for relevance-based CPC, or what they would generally pay for an ordinary keyword campaign. The index would help tell businesses whether investing in a campaign based on a certain set of keywords is more or less valuable to them than the average campaign. The formula for the index takes the 50 most stable campaigns among those which DoubleClick manages through its Performics service, then totals the cost of all the 50 campaigns based on CPC, and divides that sum by the number of keywords in the clients’ collective budgets. As a result, Performics 50 generated a concept called cost-per-keyword (CPK) – what an advertiser actually pays to reserve a keyword in an average campaign. In the fourth quarter of last year, the CPK index rose from the previous quarter’s $35.37 to a high of $54.14, an indication that online ad campaigns became 53% more effective over the holidays. When a DoubleClick or Performics client measures its CPK against the P50 index, it’s determining its campaign’s relative worth and stability – a very valuable metric. In such campaigns, DoubleClick may serve as the ad broker, but Google’s AdSense may serve as the ad distribution system. In this instance, the two companies aren’t really competitors. Now, go back to what Schmidt said: Google’s most compelling reason for acquiring DoubleClick, he said, was the opportunity to combine tools and metrics for display advertising (CPC) as well as Google’s more search-centric ads, into a single console. Indeed, that does sound attractive. But that contrasts with what Schmidt said later about the impressiveness of DoubleClick’s management team – one of the few comments actually made during the entire conference about DoubleClick’s workforce, even though its CEO, David Rosenblatt, was present for the conference. So what did Rosenblatt think the value of the merger was? “Speaking from DoubleClick’s point of view,” he said, “our focus on customers and their requirements remains completely unchanged, except to the extent that, by virtue of this deal, we’re able to bring to bear Google’s resources and R&D capabilities, which we think will result in better products and better services. And I think Google realizes, as much as anyone, that most of the value of this business lies in our customer relationships and our employees, and both of those are high priorities.” So Rosenblatt made it clear – if he hadn’t prior to the conference call – that he wants his part of the business to remain intact. So DoubleClick’s #1 and #2 concerns may be Google’s #2 and #1 concerns, respectively – which may not be a perfect fit after all, but perhaps a fit nonetheless. But as far as the goal of integrating tools was concerned, Google president Sergey Brin made clear – in typical, reliable Sergey fashion – that the two companies hadn’t actually broached that topic just yet. At one point, Brin was asked whether information from search results will be made available to advertisers directly, as part of the unified metrics Schmidt discussed. “Obviously, we’re separate companies now, so we don’t have the opportunity to discuss [that sort of topic] now,” Brin responded. At another point, Brin was faced with having to answer a question on a very sticky topic that the other executives may not have considered – especially since they didn’t speak up. Performics’ current clients, stated a J. P. Morgan analyst, include Yahoo and Microsoft. Does that change now? Which, as was said earlier, could be late in this year. So to summarize, Google’s and DoubleClick’s technologies will be compatible and unified, except where they can’t be. DoubleClick’s management and employees will be integrated into the new company, except for those who may not be. DoubleClick’s customers are considered of prime importance, except for a certain number whose fate as clients awaits the end of the merger. It’s a done deal, except for the deliberations over technologies and metrics, the decisions about who will serve where, the little business over what to do with DoubleClick’s little business, and a bit of paperwork with the FTC. Other than that, it’s worth $3.1 billion in cash. That’s a lot of investment for something so indefinite. Although earlier reports have indicated Microsoft was close to a deal with online advertising firm DoubleClick, sources now say Google is emerging as a top contender as the price of the company continues to grow. The Wall Street Journal said Monday that as the likely acquisition price surpassed the $2 billion mark, Microsoft has been slow in responding with a counter offer. Negotiations were described as “fluid,” although a deal could be announced in days. Several companies, including AOL and Yahoo, as well as private investment firms, have been rumored to have negotiated a deal with DoubleClick. It is unclear whether those companies are still in the running. Google and Microsoft are locked in an increasingly bitter battle for Internet advertising dollars. While Google is no doubt the behemoth in Web ads, Microsoft has made motions to make up lost ground, such as its adCenter offerings. Much of the interest around DoubleClick likely has to do with concerns over Google’s dominance in the industry. DoubleClick has large customers, including the AOL network and MySpace, and a Google buy would strengthen the company’s hold on Web advertising. Neither Google, Microsoft, nor DoubleClick were returning requests for comment on Monday. BOSTON – Several illuminated electronic devices planted at bridges and other spots in Boston threw a scare into the city Wednesday in what turned out to be a publicity campaign for a late-night cable cartoon. Most if not all of the devices depict a character giving the finger. Peter Berdovsky, 29, of Arlington, was arrested on one felony charge of placing a hoax device and one charge of disorderly conduct, state Attorney General Martha Coakley said later Wednesday. He had been hired to place the devices, she said. Turner Broadcasting, a division of Time Warner Inc. and parent of Cartoon Network, later said the devices were part of a promotion for the TV show “Aqua Teen Hunger Force,” a surreal series about a talking milkshake, a box of fries and a meatball. Authorities are investigating whether Turner and any other companies should be criminally charged, Coakley said. It wasn’t immediately clear Wednesday who might have hired Berdovsky. “We’re not going to let this go without looking at the further roots of how this happened to cause the panic in this city,” Coakley said at a news conference. Those conducting the campaign should have known the devices could cause panic because they were placed in sensitive areas, she said. Turner did not notify officials of the publicity campaign until around 5 p.m., nearly four hours after the first calls came in about the devices, she and others said. At least 14 of the devices were found, Coakley said. “The packages in question are magnetic lights that pose no danger,” Turner said in a statement. It said the devices have been in place for two to three weeks in 10 cities: Boston; New York; Los Angeles; Chicago; Atlanta; Seattle; Portland, Ore.; Austin, Texas; San Francisco; and Philadelphia. “We regret that they were mistakenly thought to pose any danger,” the company said. As soon as the company realized the problem, it said, law enforcement officials were told of their locations in all 10 cities. The marketing firm that put them up, Interference Inc., has been ordered to remove them immediately, said Phil Kent, Turner chairman. Interference Inc. had no immediate comment. A woman who answered the phone at the New York-based firm’s offices Wednesday afternoon said the firm’s CEO was out of town and would not be able to comment until Thursday. There were no reports from police Wednesday of residents in the other nine cities spotting similar devices. Homeland Security Department spokesman Russ Knocke praised Boston authorities for sharing their knowledge quickly with Washington officials and the public. “Hoaxes are a tremendous burden on local law enforcement and counter-terrorism resources and there’s absolutely no place for them in a post-9/11 world,” Knocke said. Authorities said some of the objects looked like circuit boards or had wires hanging from them. The first device was found at a subway and bus station underneath Interstate 93, forcing the shutdown of the station and the highway. Later, police said four calls, all around 1 p.m., reported devices at the Boston University Bridge and the Longfellow Bridge, both of which span the Charles River, at a Boston street corner and at the Tufts-New England Medical Center. The package near the Boston University bridge was found attached to a structure beneath the span, authorities said. Subway service across the Longfellow Bridge between Boston and Cambridge was briefly suspended, and Storrow Drive was closed as well. A similar device was found Wednesday evening just north of Fenway Park, police spokesman Eddy Chrispin said. Wanda Higgins, a 47-year-old Weymouth resident and a nurse at Massachusetts General Hospital, heard about the threat as she watched television news coverage while preparing to leave work at 4 p.m. Messages seeking additional comment from the Atlanta-based Cartoon Network were left with several publicists. “Aqua Teen Hunger Force” is a cartoon with a cultish following that airs as part of the Adult Swim late-night block of programs for adults on the Cartoon Network. A feature length film based on the show is slated for release March 23. The cartoon also includes two trouble-making, 1980s-graphic-like characters called “mooninites,” named Ignignokt and Err — who were pictured on the suspicious devices. They are known for making the obscene hand gesture depicted on the devices. Youtube’s music video free-for-all may soon come to a close, but not in the way many once feared. Google announced it is experimenting with video advertisements tied to the music videos from Sony and Warner Music Group as part of a four week trial in preparation for a wider roll-out. According to the Reuters article, the ads will be targeted specifically at embedded content displayed on other sites. In a departure from Google’s Adsense, the advertisements are pay-per-view (CPM) rather than pay-per-click(CPC). Interesting to note that revenue will be split three ways under the new system. Labels, YouTube and the syndicating website will all get a cut although details are unavailable surrounding the exact amounts. I’ve been unable to find an example of the new ads in the wild, have any of our eagle-eyed readers seen the new system at work? 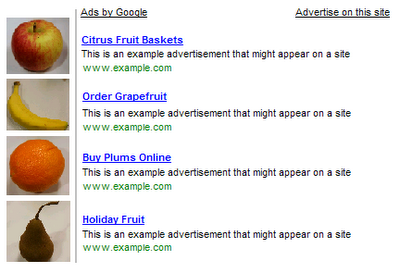 Google has clarified that lining up images near to AdSense ads [see above image] are against the Google TOS. Now, publishers cannot exploit these strategy and persuade their users into believing that they are not ads. You can read the Google explanation here.